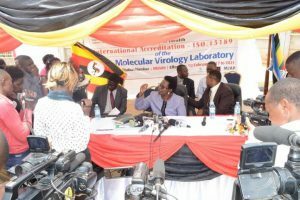 The Uganda National Reference Laboratory for Early Infant Diagnosis and HIV/Hepatitis B Viral Load at the Central Public Health Laboratories (CPHL) received International Accreditation to ISO 15189  through South African National Accreditation System (SANAS). This is one of the 100 laboratories that have been implementing the World Health Organization’s (WHO) Stepwise Laboratory Improvement Process Towards Accreditation (SLIPTA) programme  in Uganda with support from the African Society for Laboratory Medicine (ASLM). CPHL is the second national reference laboratory in Uganda to achieve international accreditation after implementation of SLIPTA, following the accreditation of National Tuberculosis Reference Laboratory (NTRL) in 2013. In recognition of its quality status, the WHO designated the Uganda NTRL as a Supranational Reference Laboratory. This means the NTRL can now provide both reference testing and systems strengthening support to other tuberculosis reference laboratories elsewhere in the world. Indeed, the Ugandan NTRL and CPHL laboratories now provide laboratory systems strengthening support to a combined total of 20 countries on the African continent. At a function organized to celebrate CPHL’s achievement of International Accreditation, the Permanent Secretary for the Ministry of Health, Dr. Diana Atwiine, stated that Government of Uganda recognizes the fact that more than 70% of decisions made for patient management and disease prevention and control depend on laboratory results, further indicating that this is why the government has made the laboratory sub-sector a priority. “International accreditation means the results produced at CPHL are accurate and credible, and can be trusted by the doctors in the treatment of patients”, she said. The 2020 goal of the Uganda Ministry of Health is for up to 25 of the 100 sub-national laboratories currently implementing SLIPTA to be accredited to international standards. This is in line with the second of ASLM’s 2020 Strategic Goals, which focuses on support of a rigorous system of laboratory standards in Africa that lead towards accreditation. “Our goal is to help ASLM achieve a significant portion of its 2020 laboratory accreditation goal here, as we improve the quality of laboratory and health services for the people of Uganda,” said Mr. Steven Aisu, the Head of Uganda’s CPHL.